This powerhouse has the same sized sensor as the Olympus mirrorless cameras and boasts improved autofocus, 5-axis image stabilization, great high ISO capability and more. However, its real strength is for shooting video. The original GH series cameras were discovered to be hackable by initial users, allowing them to be unlocked for high video bitrate and control. Since then Panasonic has made these features standard, giving photographers and videographers professional level controls in a small camera body. Paired with any of the Panasonic or Olympus m4/3rds lenses there is a wide range of options for shooting both photos and videos underwater. Excellent rectilinear wide angle options like the Panasonic or Olympus 7-14mm or the Panasonic 12-35mm make great video options. In addition, the Panasonic 45mm or Olympus 60mm lenses allow for excellent macro shooting. 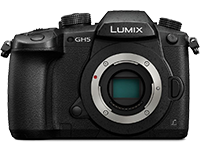 The Panasonic GH5S camera has been based off it's sibling the GH5, but is optimized for video shooting and low-light performance. 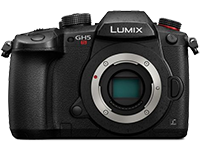 No other camera comes close to the GH5s with respect to offering the best image quality at such a low price and small size. It is packed with great features such as 10.28MP, 4k cinematic video, 6K & 4K photo, advanced image stabilizer, 225 Autofocus areas and a lot more. While it primarily gets its hype as a camera built for video, don't let that fool you! It has the capabilities of recording 14 bit raw files, and shooting 8-12fps (depending on if you're shooting continuous auto focus or single AF). The Panasonic S1R is Panasonic’s first full-frame mirrorless camera and very well might be the jewel on the crown of full-frame mirrorless cameras to date. The S1R has a 47.3MP sensor, making it the highest resolution full-frame mirrorless camera so far. The S1R also features the highest resolution EVF on any camera as well as the ability to shoot 4K at 60fps – something full-frame mirrorless shooters have long been waiting for. All in all, the Panasonic S1R breaks new ground in full-frame mirrorless cameras and could potentially be THE most popular camera of 2019. The S1 vs S1R are quite similar, just taking a sacrifice in MP in order to offer a more affordable camera. S1 = 24MP, S1R = 47.3MP. The Panasonic Lumix LX100 Mark II is an incredible compact camera with a micro 4/3rds sensor. It offers not only excellent quality for its still images, but also incredible video recording with up to 4K resolution available. Laid out in a manual style with physical buttons and dials for all settings it allows the user a more fluid shooting experience, versus digging through various menus to select the functions used most often (a common struggle with some compact camera designs). The new Mark II offers a 17MP resolution, 75mm f/1.7-2.8 lens, and 11fps burst shooting. The Panasonic Lumix DMC-LX10 offers a 1" display, and 20.1MP high sensitivity sensor. A new f/1.4 - 2.8 lens with 3x zoom capabilities gives you additional versatility in your shooting. It's larger sensor size can provide sharp stills, 4K video, and all within a still compact design. It also is offered at a cheaper price point than the LX100 II, so the decision between the two can be quite difficult for those looking for an affordable compact camera with the capabilities of shooting quality images and video!